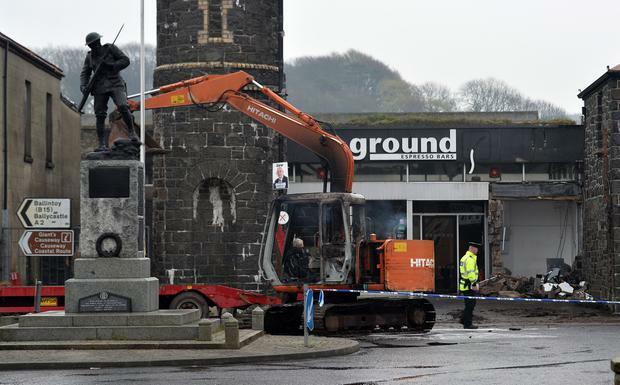 Thieves have used a digger to rip an ATM machine from a wall in Co Antrim. It is the ninth such theft of a machine in Northern Ireland this year. 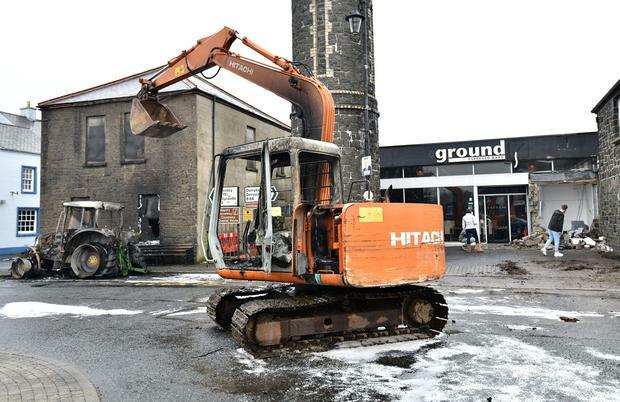 In the latest thieves used a tractor and trailer to transport a digger to the Market Square area of Bushmills at around 3.30am on Tuesday. The excavator was then used to rip the machine from the wall. 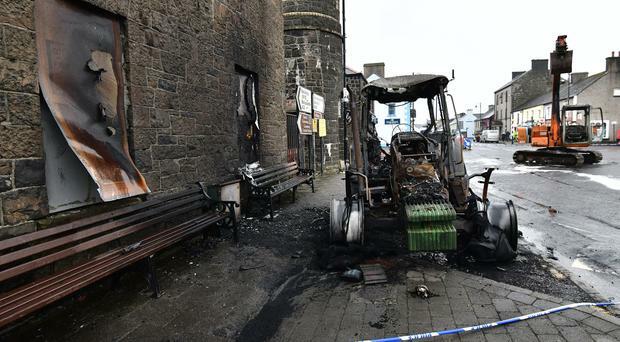 Both the tractor and the digger were set alight and destroyed by fire with police and the fire service attended the scene. TUV MLA Jim Allister said a lack of police presence had left the area "wide open for these gangs" and the "criminals were winning". The diamond area of the town remains sealed off as police continue their investigations. There is concern in Bushmills over the loss of the machine just ahead of the busy Easter holidays. One witness said: "At about 3.20am I heard a massive crash followed by another crash, I though it was thunder. It's unreal that this has happened in our village. "It now means that people will not be able to get cash especially coming up to the Easter holidays, when the village will be very busy with tourists given its location in proximity to Bushmills Distillery and the Giants Causeway." 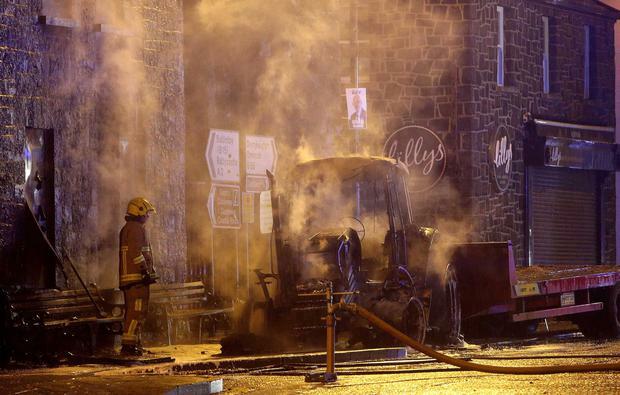 A short time later another vehicle was found burnt out at the nearby Craigboney Road near Bushmills. It is believed that both incidents are linked. There has been a spate of thefts of machines at various mainly rural locations across Northern Ireland over recent months. On Friday police issued an appeal for communities to be on the look out for heavy plant machinery operating in the early hours of the morning. They also urged builders to ensure their machinery was secured revealing one incident was thwarted because a digger was fitted with a functioning immobiliser. "We need communities to help be our eyes and ears," said Detective Chief Inspector David Henderson. Police have set up a special team of detectives to investigate the thefts. They have also upped patrols at vulnerable and high risk locations. Police have defended their response to the recent spate of thefts saying they “can’t be everywhere at once” and called on the public’s support to try and catch those responsible. Over recent days police have posted several updates of their officers visiting cash machines throughout Northern Ireland. "We don’t have crystal balls,” one officer said on Facebook in response to criticism of police actions. There are concerns communities could be left without cash machines. Retail NI, which represents independent traders has said shop owners feel "under siege" that they will be next. Mr Allister has expressed his anger at the latest theft after a similar raid in Ahoghill earlier this month. He said: “The paucity of policing in North Antrim is, I believe, making life easy for the criminals. With barely a police officer or police vehicle available within north Antrim during the night, with such service as there is withdrawn to Coleraine, the area has been left wide open for these gangs, who are not ignorant of the opportunities lack of policing presents. “After Ahoghill I expected targeting of ATMs, in terms of surveillance and increased patrols, by the PSNI, but once more the criminals are winning. This is not good enough. Police have been contacted for a comment. Anyone with information should contact detectives on 101 quoting ref 106 16/04/18 or Crimestoppers on 0800 555 111. By Mark Edwards The devastated partner of murdered journalist Lyra McKee has said her legacy will live on "in the light that she has left behind".